Botox injections (botulinum toxin injections) are used medically in tiny doses to alleviate unwanted muscle contractions. When injected into these muscles the treatment produces a temporary relaxation in the muscles, lasting approximately 3-4 months. Botulinum toxin injections are commonly used by oculoplastic surgeons for the treatment of a condition called “blepharospasm” which results in an involuntary eyelid closure, but the same injections can also be used to improve the cosmetic appearance of facial wrinkles and lines. They can also be used to enhance the results of cosmetic eyelid and brow lift surgery and even to achieve a non-surgical brow lift in some patients. In my practice I use Azzalure. Over the course of the last 25+ years we have given thousands of these injections. A patient with marked frown lines and marked hooding of the upper eyelids. 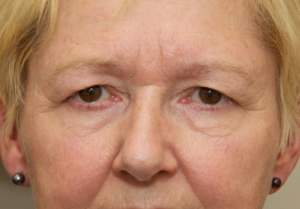 The patient seen after a bilateral upper lid blepharoplasty and endobrow lift and the use of botulinum toxin injections. Recent research suggests that these injections can help to reduce scarring by inhibiting the action of fibroblasts, cells that produce scar tissue. The injections can improve the appearance of lines or wrinkles that the action of the injected facial muscles has formed e.g. frown lines/laughter lines/forehead lines. 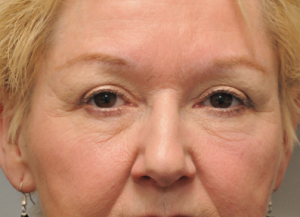 The injections can produce a brow lift or help to maintain a brow lift following surgery. The injection of botulinum toxin into the area below the angle of the mouth can help to raise the smile. The injection into the chin can help to improve dimpling/a horizontal line in this area. A series of 4-5 injections along the jaw line can help to reduce early jowling by weakening the platysma muscle. Very conservative injections along platysma bands can improve the appearance of the neck. Injections into the upper lip can improve the appearance of vertical lip lines. Injections into the lacrimal (tear) gland can reduce the production of tears in some patients. Botulinum toxin injections given into the forehead/scalp can help patients with refractory migraine. Recent research suggests that the injections can help to reduce scarring by inhibiting the action of fibroblasts. Unwanted effects may occur from the spread of the botulinum toxin to other muscle groups, but these effects are rare and are temporary. Higher doses may cause paralysis in nearby muscles (e.g. in the upper eyelid resulting in a droop of the eyelid). It is for this reason that a low dose is used initially and increased later depending on the response. As with all injections, bruising may occur but the risk of this is minimized by applying firm pressure immediately after the injection. Because of this it is important to inform your surgeon if you have a bleeding disorder, or if you are using anti-coagulants e.g. Warfarin, or Aspirin or arthritis medications such as Ibuprofen. Excessive bruising can carry the toxin to unwanted areas e.g. the upper eyelids causing an unwanted droop. Allergic reactions to the toxin itself have not been recorded but extremely rarely a skin rash or localised swelling has been reported. We have never experienced such a reaction. More detailed information can be obtained from our clinic, Face & Eye: www.faceandeye.co.uk – Tel: 0161 947 2720. The information can be posted or emailed to you. No follow-up appointments are usually required. Just telephone the clinic to arrange further injections as and when required. We are fellowship trained ophthalmic plastic and cosmetic oculo-facial surgeons who have a vast amount of experience with the use of facial botulinum toxin injections. We have given thousands of such injections, and use these treatments every week in our practice. We also use botulinum toxin to supplement the effects of cosmetic eyelid surgery and brow lift operations. Do the injections cause any pain? The injections are performed quickly and cause minor discomfort. If you prefer, you can have some anaesthetic cream applied to the areas of injection beforehand. The anaesthetic cream takes 15-30 minutes to take effect. The vast majority of patients prefer to undergo the quick injections without any anaesthetic cream. The results are very good and quite reproducible. Generally, the initial effects are seen within 3 days of the treatment and the maximum effects are seen 7-10 days after the treatment. The effects last approximately 3-4 months. Regular maintenance treatment every 3-4 months helps to prevent recurrence of the lines/wrinkles. Botox injections can also be used in conjunction with a dermal filler for deep lines although it is better to separate the treatment sessions by 2 weeks. The results of blepharoplasty surgery and brow lifts are also enhanced by the use of anti-wrinkle injections given 1-2 weeks prior to surgery. Are Botox injections safe to use? These injections have been used for a variety of cosmetic and non-cosmetic indications for over 20 years and are considered a very safe treatment with a long safety track record. Can there be side effects? Complications in the hands of a trained and experienced practitioner are very rare and all precautions are taken to minimise any risks. Some bruising may occur but the risk of this is minimised by applying firm pressure straight after the injections. It is important to let us know if you have a bleeding disorder, or if you are using anti- coagulants e.g. Warfarin, or blood thinning medicines such as Aspirin or arthritis medications such as Ibuprofen. There have been no reported long-term ill effects from the use of botulinum toxin injections. Avoid any massage to the injected areas to prevent spread of the toxin to other adjacent muscles. Patients can return to their normal activities straightaway but should avoid strenuous exercise for a few days or trauma to the injected areas. How long have you been giving these injections? We are fellowship trained ophthalmic plastic and cosmetic oculo-facial surgeons who have a vast amount of experience with the use of botulinum toxin injections. We has over 25 years of experience and use this treatment every week in our practice. We also use botulinum toxin to supplement the effects of cosmetic eyelid operations and brow lifts. I have heard that these injections are used for other reasons. What are these? Excessive sweating (hyperhidrosis) – the injections are given into the axilla (the armpit) and are very effective. The effects last longer than for the management of wrinkles and lines, usually lasting for approximately 6 months or more. To treat patients with very severe watering of the eyes e.g. crocodile tears following a facial palsy – the injections are given into the lacrimal gland. These are only given by an ophthalmic surgeon. To induce a temporary droop of the eyelid (ptosis) to protect the eye in patients with a chronic corneal ulcer or facial palsy. Migraine – the injections can be beneficial in certain patients with migraine which is refractory to other standard treatments. Scars – this is a new development – injections of botulinum toxin have been found to affect fibroblast activity, improving the outcome of wound healing. Click here to contact us for information about costs. To learn more about Botox Injections, please contact us at today to schedule an appointment.